In your small group travel to Kata Tjuta (the Olgas) and commence the walk to the Valley of the Winds, heading first to the Karu lookout. With views across the many domes of Kata Tjuta and out into the sacred Anangu men’s area, you’ll be in awe of this natural wonder. Sit back and relax as you travel into the amazing Uluru – Kata Tjuta National Park. The scenery along the way will amaze you, and with luck, you may even see some of the local wildlife such as dromedary camels and kangaroos. 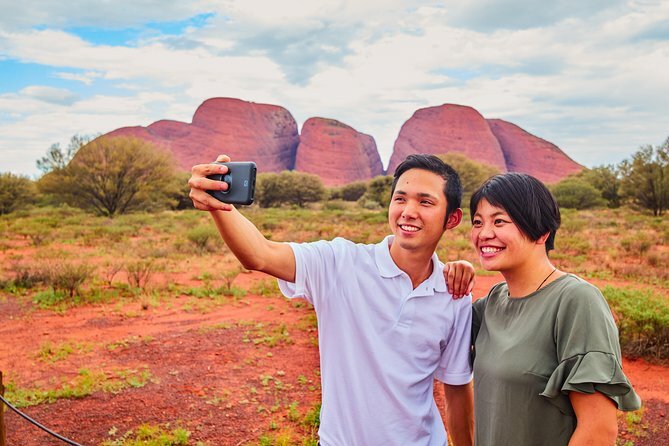 On your journey, your experienced driver guide will share fascinating stories of the geology, history and culture of Kata Tjuta, which is deeply sacred to the local Anangu people. Kata Tjuta, simply translated, means "heads many". Given the 36 steep-sided domes of Kata Tjuta, it is aptly named. This incredible formation of rock domes extends 6 kilometers (3.7 miles) into the ground and is the remains of erosion that began more than 500 million years ago. The area is sacred under Anangu men’s law, of which, details of many stories of Kata Tjuta are not known except to initiated men. Watch the spectacular sunrise over Kata Tjuta with Uluru in the distance from the western dune viewing area, with light breakfast included. Begin your guided walk through Valley of the Winds, heading first to the Karu lookout. With views across the many domes of Kata Tjuta and out into the sacred Anangu men’s area, you’ll be in awe of this natural wonder. Next stop is the Karingana lookout. This walk can be a little challenging, but well worth the effort. It takes you down into a timeless haven within the domes through trickling creek beds. At times of extreme heat the walk may not be available, but will be substituted with an alternative walk. Shorter walks are also available for those not wanting to walk to the second lookout. This tour was the best of the tours that I di in Ayers Rock! Geoff and Trys were our guides and they were very knowledgeable and made the morning tour an awesome experience. Id do this tour over Uluru any day! A well organised tour which ran smoothly. Well informed tour guides who made it interesting as well as fun. A good choice of walks, with a good breakfast bag and hot drinks on arrival at the sunrise spot. A great sunrise with fantastic photo opportunities. This was a great tour. Be aware that it is quite strenuous (especially if it’s raining). Take a hat, water, bug repellant, and sunscreen. This tour experience was a very nice experience. Firstly, the Sunrise is absolutely stunning. You can see both Uluru and Kata Tjutacloser when the sun rises. Beautiful! The Valley of the Winds tour was definitely different. Lot of walking but just enough. Not too much, nor too little. I just thought, the second lookoutfinal destination was not as the best as I expected it to be. I felt like the view was a bit closed up, but still very nice. Highly recommend this tour if you have the time. If you don't, definitely at least the Kata Tjuta Sunrise!! Great tour by AATkings. Caught Kuta Tjuta sunrise just in time. The hot chocolate served as we left the bus really helped warm us up for the cold winter morning. The guides were also knowledgeable about the trails to the various look out points. Definitely recommend this tour. You will be required to bring your own water bottles, which altogether are able to hold a minimum capacity of 2 litres per person (these can be filled with water on board the coach).